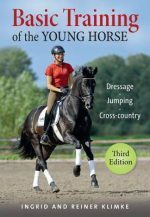 Mark Russell (1951-2016) explains the theories and methods of the Old Masters in his easy-to-implement progression suitable for educating the riding horse in all disciplines. Lessons in Lightness offers the rider the concept of educating rather than training the horse using relaxation as the cornerstone. A tense horse has difficulty assimilating new information, yet relaxation often can be a difficult state to achieve. Mark Russell demonstrates not only how to attain relaxation but also how to maintain it throughout the horse’s education. Following Mark’s well-illustrated advice, energy is created in the horse without tension; the resultant free-flowing energy can be merely directed instead of forced. The progression of obtaining relaxation is fully explained by first accessing the horse’s jaw, then working down the entire spine to the hind feet. The method incorporates all lateral movements, in-hand work and under-saddle work in all gaits. Educated using this progression, the horse will develop flexion and strength in a bio-mechanically beneficial way while avoiding emotional stress and physical strain. In this vein, Lessons in Lightness is written with the horse’s perspective in mind. After working with horses in a variety of capacities, Mark studied with Master Nuno Oliveira and, according to Mark, this “changed everything.” Mark enriched his horsemanship with his practice of Tai Chi, Chi Gung, and Natural Horsemanship. Mark was a popular clinician who was uniquely able to assist all horses and riders, regardless of their experience level in their chosen discipline. Mark Russell was tragically killed in a riding accident on June 12, 2016. Mark’s wife, Hela is committed to preserving his life’s work. “The principal reason for teaching the horse to be light to the aids is to create the healthy flow of energy through the horse’s body. This is achieved through relaxation. In teaching relaxation to the horse, the trainer, in effect, offers the horse an understanding of how to let go and release tension. The horse’s thought process is as important as the teacher’s; in fact, the more the trainer recognizes the necessity for the horse to understand, the better a teacher she will become.